Last week I upgraded my embroidery machine – a totally impulsive decision. 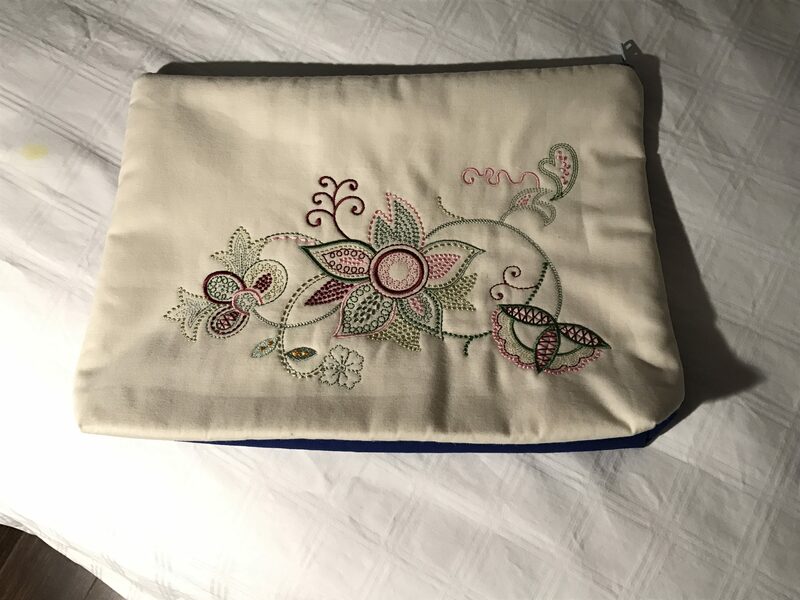 My Pfaff Creative Sensation was about 5 years old (no longer offered by Pfaff and quite substantially depreciated since the new Creative Sensation Pro II was released within the last couple of months). My local Pfaff dealer was offering a good trade-in on my old machine so I decided to make the swap. The differences between the two machines are subtle – the Pro II embroiders noticeably faster, there are a couple of new fancy stitches, the workings are all just a bit more stable than my original machine. The trade up made some sense since all my embroidery hoops work on this machine as do all the feet in my large collection of sewing machine feet. So I took the machine home, unpacked it, and decided to give it run by making a zippered bag for storing the foot pedal and cord when I need to transport the machine. 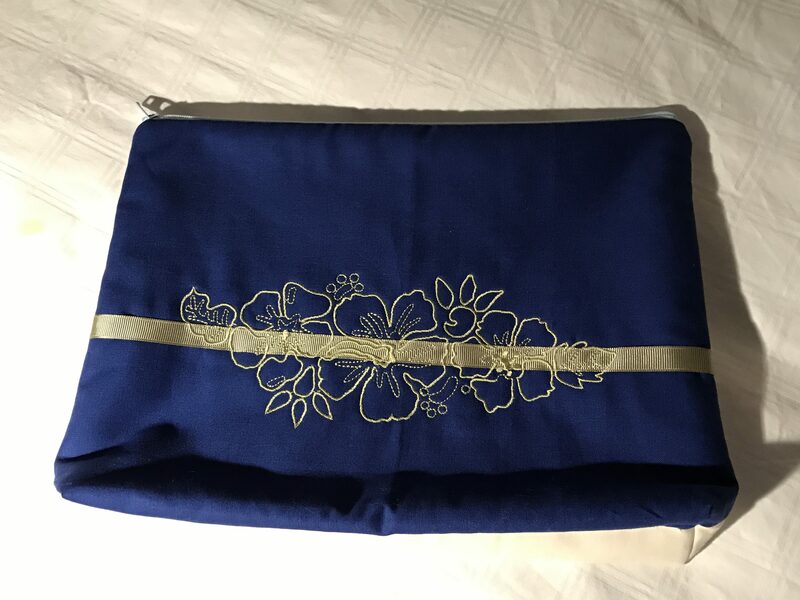 I loaded one of the embroidery designs included on the machine, picked out some rayon embroidery thread and stitched out the design. Did a nice job and this was where I could see the increase in embroidery speed. The stitches were properly embedded in the fabric layers without my having to make any tension adjustment (which I often had to do on the old machine). No thread breakage – always a good sign. One of the few hoops I don’t have is a “texture” hoop – one which lets me add ribbons and other trim to the surface of the fabric before stitching out an embroidery. Instead, I took a piece of grosgrain ribbon, lightly glued it along the middle of my fabric, hooped the fabric and stitched out the embroidery. Worked fine! I added a zipper, a lining, and stitched up the bag. Didn’t take long. Then I played around for a while testing out various stitches on a scrap of fabric. These days, however, I primarily use my embroidery machine for quilting. Once my quilt top and quilt back are pieced and sewn (I actually prefer my straight stitch quilting machine for that), and the quilt sandwich pinned, I do the final quilting by hooping the pinned quilt segment by segment (easiest is when the top is actually constructed from blocks; more demanding is hooping from edge to edge – which is the job I just finished today on my Fibonacci quilt (I’ve quilted half of the border; I’ll complete that job tomorrow, then add the binding and label)). The Pro II runs more quietly and smoothly than the original Creative Sensation. I can see I will turn to it for more than just quilting. The new machine is now sitting proudly on my new sewing table which is deeper and a bit longer than the previous table (on which is sitting my straight stitch quilter) – making the whole business of quilting with the embroidery machine much easier (much less drag on the embroidery unit since the weight and expanse of the quilt is distributed over a much larger surface). I can see I’m gonna be happy having upgraded the embroidery machine.